The Color of Pomegranates is a 1969 Soviet film written and directed by Sergei Parajanov. It made the Top 10 list in Cahiers du cinema in 1982 and Top 100 in Time Out. Filmmaker Mikhail Vartanov has said, "besides the film language suggested by Griffith and Eisenstein, the world cinema has not discovered anything revolutionarily new until The Color of Pomegranates, not counting the generally unaccepted language of the Andalusian Dog by Bunuel". According to Michelangelo Antonioni, "Parajanov�s Color of Pomegranates is of a stunningly perfect beauty. 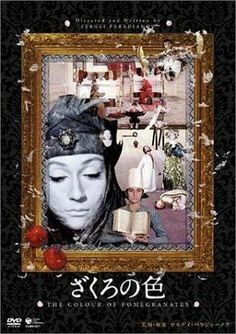 Parajanov, in my opinion, is one of best film directors in the world."